30 years ago Gallery Stroll was an underground event. Since then it has risen to a mainstream monthly occasion celebrating the extraordinary art scene in Salt Lake City. Offering the highest caliber of galleries and artists, rivaling SoHo or San Francisco, this little mountain town is abundant with arts and cultural events. What better way to enjoy the scene than during the monthly Gallery Stroll? It takes place on March 20 from 6-9 p.m. An explanation for this thriving vibrant art community could be the exposure that budding artists receive. Branded And On Display currently at the Salt Lake Art Center features the work of over 20 artists that looks at the commercial messaging we receive daily. Some images are explicit and others more subliminal, but the repetition proves to be mind-altering. Would you recognize the word Coca Cola no matter what form it is placed on? Or the striking swoosh known only as the Nike symbol? Think of the brands Band Aid or Google that have transformed into verbs, adjectives and nouns. “Put a Band Aid on your cut”. Or “I will google him.” The exhibit is presented in video, installation, sculpture, painting, photography and sound - just as they are introduced into our subconscious, but presented in altered states to allow the viewer to reflect, rewind and reprogram. The exhibit opened Feb. 21, but you can still catch the “replay” through May 23. The Salt Lake Art Center is located 20 South West Temple and open Tuesday- Thursday and Saturday 11 a.m. - 6 p.m., Friday from 11a.m. - 9 p.m., closed Sunday and Monday. The Salt Lake gallery community grew by one in the last few months, The Meyer Gallery (who has been making a name for itself in Park City since 1965) has opened its second location in the new Metro Lofts at 350 S. 300 East. 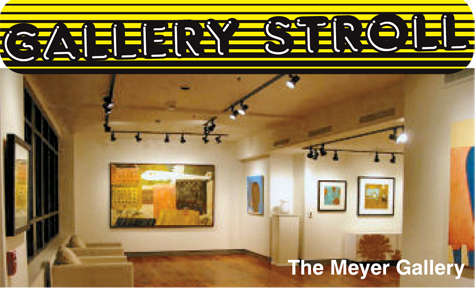 Adjacent to the flourishing Broadway artisan community Meyer is positioned to become a must stop with over 2,000 square feet of exhibit space, a solid roster of seasoned and emerging artists, and a mix of local and national painters and sculptors. Whether it’s during Gallery Stroll or your lunch break, I highly recommend stopping in for a little revitalization and refocusing with the bold yet soothing paintings and sculptures. It’s a great way to counteract the hazy winter blues. Working at the SLC Film Center as the Marketing and Community Outreach Manager, has given me the opportunity to pause at their art shows on Main Street that occur at 4 p.m. and 6 p.m. daily. Last August the SLC Film Center unveiled Sidewalk Cinema, the latest technology in outdoor video displays. These “big screens” showcase upcoming SLC Film Center trailers and film shorts, but as of recently, daily art shows and art video installations are also being included. Throughout the month of March you can catch The 337 Project Images and Artists. The film features a video walkthrough of the 337 Project by Alex Johnstone and Davey Davis. They catch up with artists Trent Alvey and Jan Haworth and their latest endeavors. The film is topped off with clips from the final hours of the 337 Project and its destruction. The show lasts approximately a half hour and can be seen at 260 South Main and 122 South Main. The video exhibits change with every gallery stroll.